Ponorogo is one of the regencies in East Java Province which is famous for Reog art. But Ponorogo is not just about Reog, Ponorogo also has an amazing natural beauty. Its mountainous and hilly landscape offers a panoramic view and cool atmosphere. Let’s find out the top things to do in Ponorogo Indonesia..! Lake Ngebel is a popular tourist attraction located at the foot of Mount Wilis. The lake has an area of about 5 km square with temperatures ranging from 20-26 degrees Celsius. Lake Ngebel is Ponorogo’s favorite place for picnic or family vacation. 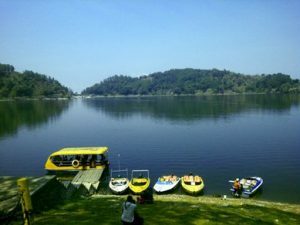 To get around the lake visitors can rent a speedboat at a cost of Rp 60,000 per round or take a water bus at a cost of Rp 7,000 per person. Lake Ngebel is located in Ngebel Village, Jenangan, Ponorogo Regency. It’s about 30 km from downtown Ponorogo. The admission is Rp 4,000. Besides Lake Ngebel, you should stop by Lake Rambut Monte. It’s one of things to do in Blitar, East Java. 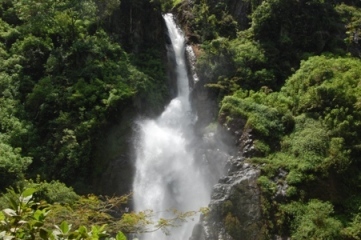 Coban Lawe is a waterfall that is still virgin and rarely visited by tourists. However, the beauty of this waterfall is rising on social media and invites curiosity. From the parking lot to the location of Coban Lawe Waterfall you need to walk about 10 minutes. Beautiful green rice terraces, lush pine forests and fresh vegetable crops will adorn your trip. 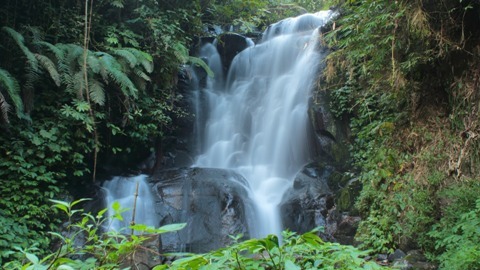 Coban Lawa Waterfall is located in Krisik Village, Pudak, Ponorogo Regency. It’s about one hour drive from downtown Ponorogo. The admission is Rp 3,000. Another great place for waterfall tour in East Java is Mojokerto. Go there and you will have lots of things to do in Mojokerto. Pletuk Waterfall has a height of about 100 meters and flows between two hills filled with green plants. The waterfall flows swiftly so visitors will be wet when they are nearby. Along the way to the location of the waterfall, you will be pampered with stretch of clove plantation, dense forest and green rice fields. The distance from the parking lot to Pletuk Waterfall is only 500 meters away. Pletuk Waterfall is located in Jurug Village, Sooko, Ponorogo Regency. It’s about one hour drive from downtown Ponorogo. The admission is Rp 2,000. Ngembag Tourist Park is a cheap and fun family vacation spot. Here there is a small lake shaded by dozens of hundred-year-old Trembesi trees. Because of its location near the city center and its cool atmosphere, Ngembag Tourist Park is often visited by people of Ponorogo. The facilities include swimming pool, flying fox, water bike and children playing ground. Ngembag Tourist Park is located at Yos Sudarso Street, Ponorogo. The admission is Rp 3,000 for adults and Rp 2,000 for children. 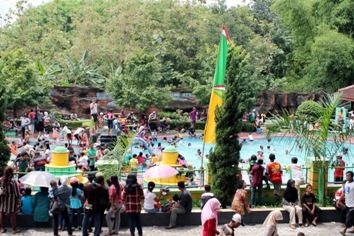 Kintamani Waterpark is a popular tourist spot in Ponorogo and always crowded by visitors on weekends. 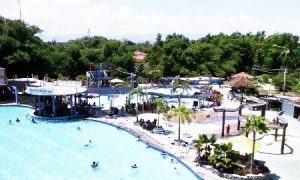 The waterpark is perfect for family holiday since it has children pools, adult pools and slides. Kintamani Waterpark is equipped with various facilities such as outbound field, praying rooms, rinse rooms, changing rooms, toilet and parking lot. There is also a restaurant with a rural ambiance that can accommodate up to 100 people. Kintamani Waterpark is located at Ki Ageng Kutu Street, Ponorogo. On weekdays the admission is Rp 5,000. On weekend the admission is Rp 10,000 for adults and Rp 8,000 for children. Rocking Ground is a beautiful green area consisting of valleys and hills. It is said that if you step on the ground it will feel rocky. This happens because the area is surrounded by hills so that water gathered in the valley to form a swamp land. When you are on a rocking ground, you should be careful because the density of the soil and the depth of the water are hard to predict. Rocking Ground is located in Pudak Village, Pudak, Ponorogo Regency. It’s about one hour drive from downtown Ponorogo. Lowo Cave is a natural cave that is famous for its mystical nuance. Every Suro and the Day of Silence many people stay overnight and meditate in this cave. 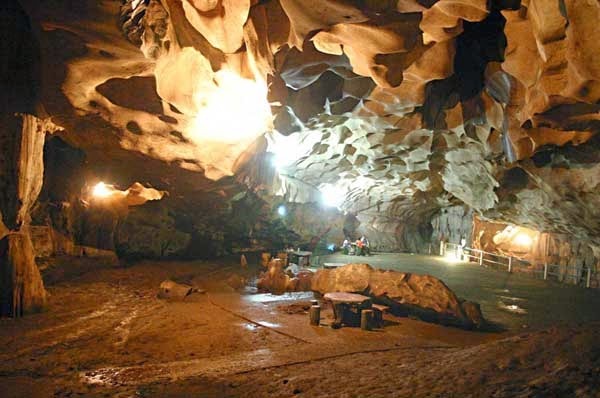 Lowo Cave has a ceiling height of 11 meters, 27 meters wide and 26 meters long. In the Lowo Cave is often found ancient human bones so that the cave becomes the object of research by various universities. Lowo Cave is located in Sampung Village, Sampung, Ponorogo Regency. It’s free entry. Anyway, if you are interested about cave, come to Tuban. Cave tour is one of things to do in Tuban, East Java. 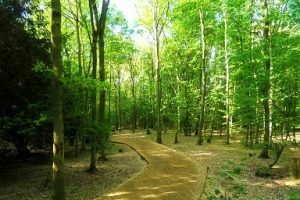 Kucur Forest has amazing scenery that gives comfortable, peaceful and pleasant atmosphere. 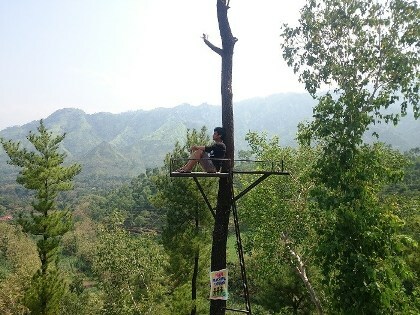 Because it is on the border of East Java and Central Java, the forest is used as a place to stop and unwind. Kucur Forest also serves as a camping ground and a national park. In addition, Kucur Forest has been equipped with adequate facilities such as praying room, parking areas, food stalls and toilets. 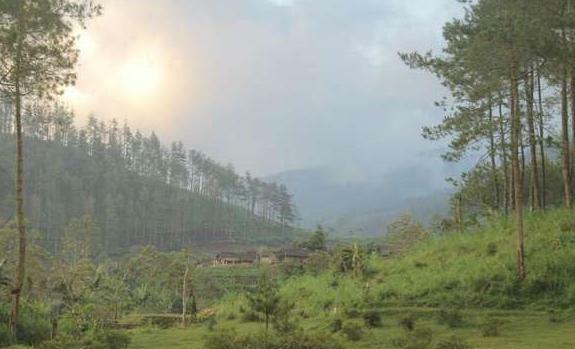 Kucur Forest is located in Biting Village, Badegan, Ponorogo Regency. It’s about 20 km from downtown Ponorogo. Tirta Husada Bath has beautiful scenery and natural hot water coming from Mount Wilis. The hot springs from Mount WIlis burst and form a river that flows into the baths. Tirta Husada Bath is open 24 hours. The bath is always crowded by visitors who want to try the benefits of Mount Wilis’s hot water that is believed to cure various skin diseases and rheumatism. Tirta Husada Bath is located in Wagir Lor Village, Ngebel, Ponorogo Regency. The admission is Rp 5,000. Mount Beruk is a rising spot in social media because its instagenic view. Here visitors can enjoy the cool atmosphere, see the towering pine trees and take pictures in the tree house. Mount Beruk is often visited by young people who are curious about its beauty. Although away from the city center, there are also food stalls for visitors to rest. Mount Beruk is located is Karangpatihan Village, Balong, Ponorogo Regency. The admission is Rp 3,000. By the way, one of famous mountains in East Java is Mount Kelud. Climbing Mount Kelud is one of popular things to do in Kediri. Surely you do not expect there are top things to do in Ponorogo. Now is the perfect time to have fun in the land of Reog. Let’s visit Ponorogo Indonesia..!